Yacon Syrup is one of the newest weight loss crazes to join the weight loss market after it was dubbed a ‘diet potato’ on a popular American TV show. It is derived from a plant that is native to South America and looks like a sweet potato but has a taste similar to a pear. Yacon is unable to be digested so it makes a good alternative low-calorie sweetener. Because of the hype surrounding Yacon Root, there are many Yacon Root supplements and syrups that manufacturers rushed to produce. While some are authentic and high quality, others are nothing more than synthetic money-making schemes. For this reason, we feel it is necessary to conduct research into any Yacon Root product to determine its integrity. This review is going to examine Swanson’s 100% Certified Organic Yacon Syrup. The manufacturer claims that their syrup is 100% pure and natural with no additives, preservatives or artificial ingredients. They claim to have the highest reported levels of scFOS at 31-89 g/kg. This product only contains 100% certified organic yacon root (Smallanthus sonchifolius) syrup. This Yacon syrup is 100% pure and exclusively derived from organically grown Peruvian Yacon root through an extraction process that does not involve any chemical solvents. It is believed to be one of the best sources of fructooligosaccharides. The fructooligosaccharides reach the large intestine where they feed the friendly bacteria in the digestive system. They stimulate the taste buds but humans cannot digest them, making it an excellent alternative to high-calorie sweeteners. It is believed to be able to suppress your appetite and speed up your metabolism. Swanson recommends taking one teaspoon of Yacon Syrup as desired. It may be used in place of honey, molasses, and other popular sweetening options. Swanson does not list any possible side effects from taking the Yacon Syrup. We were able to find that common mild side effects associated with taking high amounts of Yacon Syrup are bloating, flatulence and diarrhea. This product is available on Swanson’s website for $21.99 for a 14 oz bottle of syrup. There are no bulk purchasing options offered. Swanson will offer a refund within 12 months from the date of purchase for unused bottles. Any returns valued over $500 will be subject to a restocking fee. There are not many consumer reviews on this product. The few that we saw were mixed. Users reported an unusual taste to this syrup and returned the syrup. 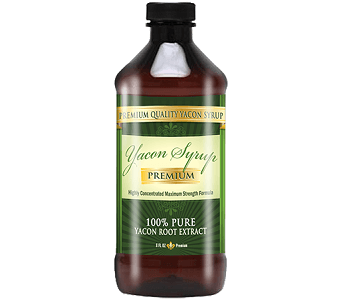 This Yacon Syrup appears to be a viable contender in the market of Yacon Root products that are currently available. It comes in an easy to pour bottle and the manufacturer offers a money-back guarantee. However, they claim to have the highest levels of FOS reported on the market but we found that to be misleading and untrue. We have found products that contain upwards of 41%. The price for a regular sized bottle is expensive relative to other options we have seen and the manufacturer does not offer any bulk purchasing options. 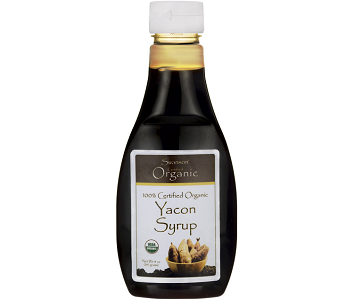 If you are using Yacon Syrup as an alternative low-calorie sweetener to replace your current high-calorie sweeteners, one 14 oz bottle can run through quickly, making it hard to financially maintain Yacon Syrup as a replacement sweetener if you decide to invest in Swanson 100% Certified Organic Yacon Syrup.